The guidelines provide a thoroughly rounded and grounded approach to best-practice dermatologic management using evidence-based principles with additional access to patient-oriented information. For fast access to proven standards of care, dermatologists worldwide can turn to the BAD Management Guidelines with confidence. A tribute to Professor Neil H. Cox (John S.C. English). Preface (Neil H. Cox and John S.C. English). 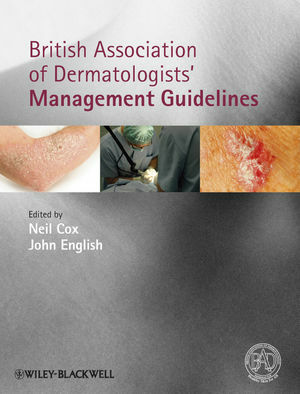 Background to the British Association of Dermatologists clinical guidelines (Neil H. Cox and John S.C. English). Writing a British Association of Dermatologists clinical guideline: an update on the process and guidance for authors (H.K. Bell and A.K. Ormerod). Ultraviolet radiation (dosimetry and calibration).